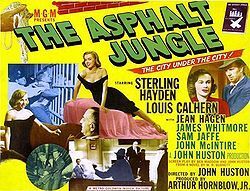 The Asphalt Jungle (1950) is an Academy Award nominated film noir directed by John Huston. The caper film is based on the novel of the same name by W.R. Burnett and stars an ensemble cast including Sterling Hayden, Jean Hagen, Sam Jaffe, Louis Calhern, James Whitmore, and, in a minor role, Marilyn Monroe as she was an unknown at the time and was not mentioned on the posters. The film tells the story of a group of men planning and executing a jewel robbery. It was nominated for four Academy Awards.